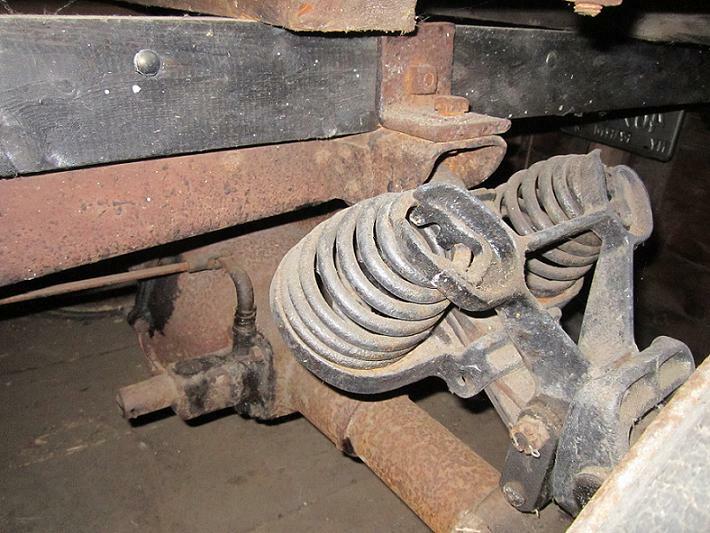 Model T Ford Forum: Double Hassler Front Shocks? 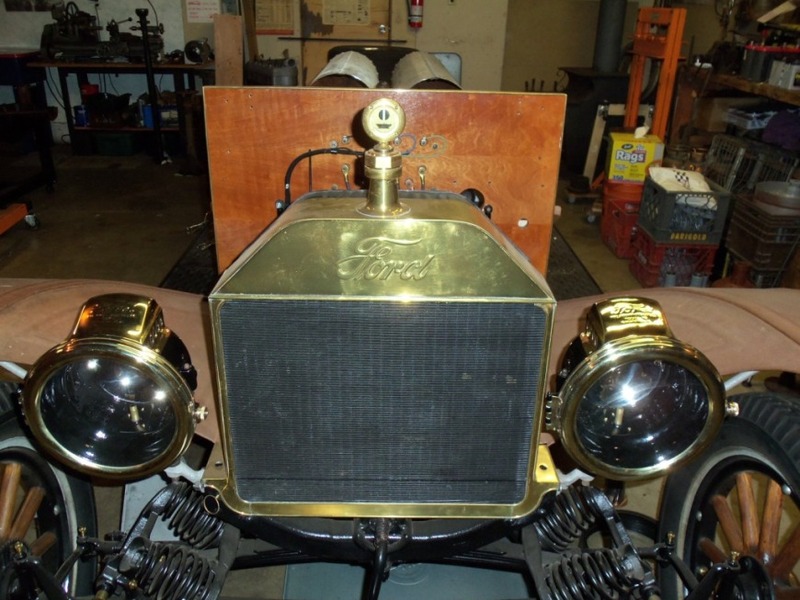 Model T Ford Forum: Forum 2012: Double Hassler Front Shocks? 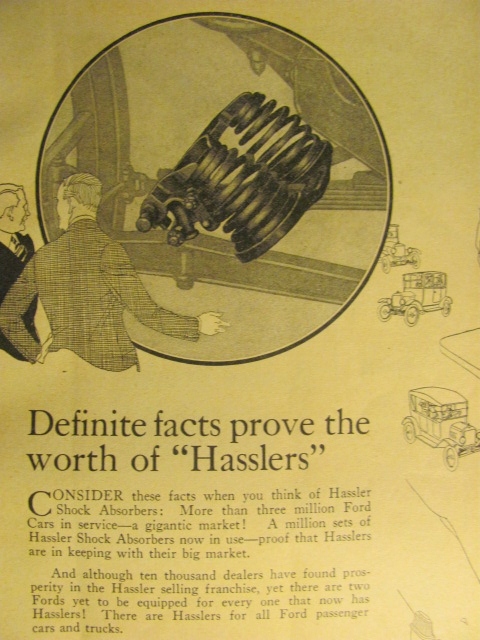 I picked up a trailer load of Model T parts and in that was this set of Hassler shocks. 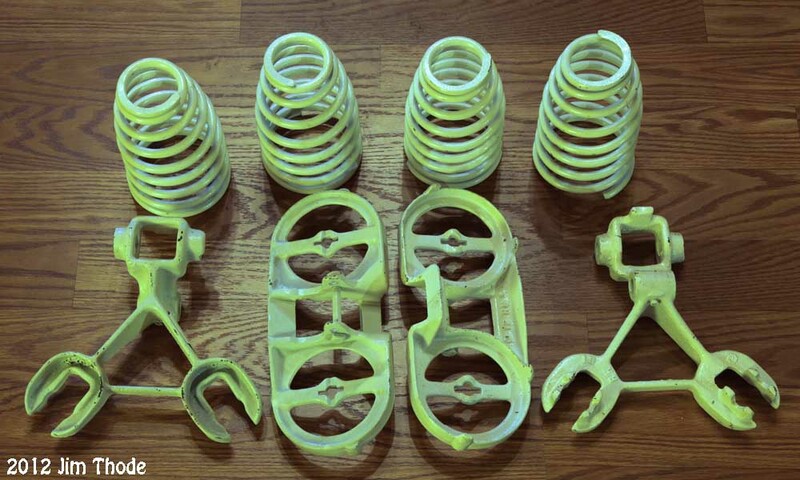 I believe that they are front shocks because they fit on the front springs and spring perches. I don't plan on using them but am interested to know what they would be used on? Why would they be used? Is there any demand for them, value? I searching around I found some info on double rear shocks but nothing on double front shocks. The owner that had them was pulling parts together for a speedster, so maybe they are a speedster item. Any thoughts or info would be appreciated. Double Hasslers for the heavier closed T's, Tudors, Fordors. Hassler made bigger ones for the TT also. I think the double shocks were mostly used on TT trucks, but I have seen them on cars. In your copied documented does it give any suggestion to use different types (single or twin) on front and rear? I could see that a sedan is quite a bit heavier on the back but not so much difference on the front. Another adv on Twin Hasslers. I have double Hasslers on front and rear of this old 15 touring I found. Hassler made the Twin versions for the heavier bodied T's. Twin on a light runabout or speedster is overkill. But single Hasslers on heavy T's isn't a good idea. These are on the front of my wife's soon to be Fire Chief's rig - maybe overkill Dan, but they are totally cool looking and functional. It says right in the Hassler Manual that you should NOT put single hasslers on a coupe or a Center Door. If you do you are asking to TIP OVER in a strong wind or sharp corner. Also I don't think that you would get near as smooth a ride on roadsters or coupes with double hasslers. Double hasslers would be too stiff for the lighter cars. But its your car do as you wish. The double Hasslers for closed cars and the double Hasslers for trucks are not the same thing. Truck Hassler springs are way heavier. Thanks for the help. Using this info I also found this ad in the Farmers Journal. 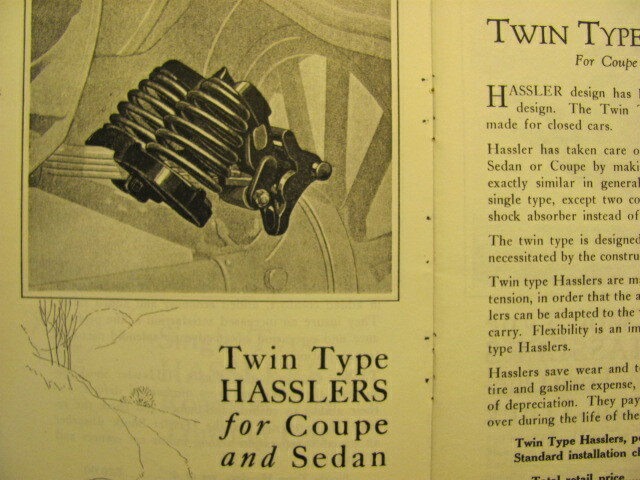 I have double Hasslers on the front of my 1918 TT. They seem to work well, although I have never driven it without them to compare. The truck is a hucksters with solid rubber rear wheels. I would like to find a set for the rear of a TT to put on it. 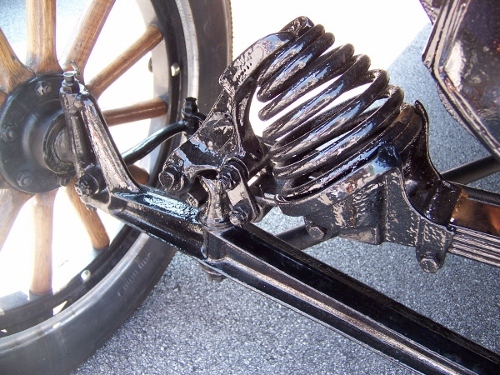 I can tell you that it is a real close fit for your knuckles when hand cranking a Model T equipped with double Hasslers on the front. Here are double Hassler's on the rear of my 20 TT. 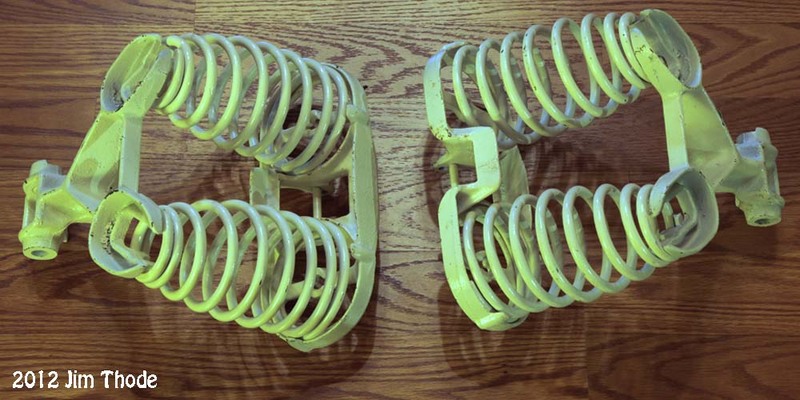 I was talking about double front shocks. If there is a size difference, I have not seen the larger or smaller version. I guess that on my next trip to Chickasha I will need to look for the size difference. (maybe the spring is a little weaker??) My three sets of fronts are all the same. Rear ones for TT trucks are definitely larger to fit the larger leaf spring. Wow, I had no idea there were TT rear hasslers! After 40 yrs I finally got a set of TT doubles, by buying a truck and taking them off and reselling the truck. But still have a pile of $$$ in them. I guess my huckster falls into the roadster/touring when it comes to weight. I only have singles in the rear and they do help on a tight turn. Before I put them on the same corner and speed she really leaned into it! I really don't understand or see the need for doubles on the front, on mine anyway, I can jump up and down on the crank and mine does not move all that much. I would like a set of doubles for the rear someday. I have double Hasslers on the front of my 23 Touring. You can really see them compressing going around turns especially with a car full of people. I get all kinds of compliments and finger points at shows.